ViFlow Group designs, engineers, manufactures and markets highly efficient heat exchangers, pressure vessels and other process equipment. Our goal is to always provide the optimised solution for each specific customer need. We also provide construction, manufacturing and installation of complete piping systems for industrial purposes, in connection to the sale of ViFlow products or as separate projects. The skill level within ViFlow is high, with in-house thermal design capabilities and a strong engineering focus. ViFlow works with special materials such as titanium and tantalum. Today, ViFlow Group consists of the manufacturing companies ÖRNALP, UNOZON and RAMAB. We have own sales personnel in Sweden and Finland, but are also actively promoting our solutions in Norway and Denmark. Our intention is to expand further through business growth and acquisitions. As well as our increased presence in offshore and oil and gas, we have many clients within the pulp and paper, energy, nuclear, chemical and metal / mining industries. 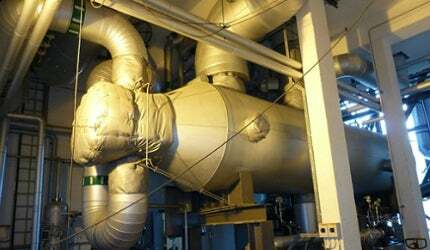 There are many different types of tube heat exchangers. Thermal pre-requisites, pressures, temperatures, operating conditions, type of fluid and cleaning requirements all have an effect on how the heat exchanger should be designed. Our tubular heat exchangers can be designed for single or multi-pass, both on the tube and the shell side. Heat exchangers can also be integrated with pre-built modules, which shortens installation time significantly. We follow the latest pressure vessel standards and can offer equipment with several different certifications. ViFlow has exclusive distribution rights for all FUNKE products in Nordic countries. FUNKE was founded in 1974 and focuses on the design and manufacturing of plate heat exchangers for nearly all industrial applications, in addition to the HVAC sector. The partnership with FUNKE gives ViFlow a wide product base, providing the capacity to always offer the right heat exchanger type for every customer need. In 2011, ViFlow Group entered into an exclusive partnership in the Nordic countries with the German manufacturer GESMEX. Their laser-welded plate and shell heat exchanger is a response to the challenges from many industrial applications and combines all the benefits of an effective, safe and compact product with an innovative design. Our in-house design department specialises in pressurised equipment. With the expertise in various special materials, our design engineers are able to respond very quickly to customer requirements and offer the best solutions. We know how to construct, design and weld our products to meet exact client specifications. A large part of the delivered units are made with special materials and the company also has an advanced knowledge of manufacturing equipment using multi-layer materials such as titanium-cladded carbon steel. ViFlow (RAMAB) carries out its own design, manufacturing and installation of complete piping systems for a number of industries. We also offer total solutions that include the dismantling of existing pressure vessels / heat exchangers and the assembly of new ones, such as insulation and all other work required to ensure a turnkey facility. Welding is one of our most important processes; all our welders are licensed and experienced at working to meet the great demands imposed by a follow-up inspection. The basis of our quality assurance has been built-up from our work in the nuclear power industry and steam turbine installations; over the years, we have gathered an impressive list of reference projects. Our company history began in 1939, when UNOZON was founded in Örnsköldsvik in Northern Sweden. ÖRNALP was founded in 1993 in the same city, and through a number of corporate acquisitions and mergers, today ÖRNALP/UNOZON is one of Sweden’s leading companies in the manufacturing of various types of tubular heat exchangers, pressure vessels and other process equipment. RAMAB was founded in 1986, but the competence and experience within the company can be traced back to the 1960’s, when Sjöö & Bornekes Mekaniska AB started production of heat exchangers for Alfa Laval. Today, more than 2,000 heat exchangers have been manufactured in RAMAB´s modern purpose-build premises in Knislinge, southern Sweden. This is also where we pre-fabricate pipe parts for our contract operations.